The proliferation of 3D printing technologies has grown to such an extent in recent times that they have encompassed applications in a diverse range of industries comprising automotive, aerospace, high tech and medical products, to name a few. Organizations have taken to adopting these technologies because of the prototyping opportunities they offer, with their long-term goals including enhancing new product development and reducing time-to-market. Equity research analysts have forecast the market for 3D printing at about US$21 billion by 2020 primarily being fueled by advancements in technology. These include an increasing capability of 3D printers in processing huge volumes of data and growth in the variety of materials ideal for 3D printing. Plastic material suppliers have also played a significant part in supporting the market for 3D printing through capacity expansions, new product development and entering into strategic alliances. The market for high-performance plastics (HPPs) is set to get bolstered by materials for 3D printing. With the progression of 3D printing from prototyping to manufacturing, the growth in metals and high-performance polymers is slated to outpace al other categories of materials, with HPP feedstocks for 3D printing likely to reach a value of several hundred million dollars. HPPs are lightweight materials that are strong and resilient enough to function as alternatives to advanced metal, ceramic and other composite parts that have been used traditionally. In particularly, the fused deposition modelling (FDM) and fused filament fabrication (FFF) segments of 3D printing offer an enormous potential for high growth of the market for high-performance plastics. These high-quality plastics have now become ubiquitous across a broad range of industries, prominent among which are the aerospace, automotive and medical sectors. High-performance plastics, such as polyetherimide (PEI) and polyetherketone (PEEK) have penetrated the 3D printing materials in the fields of aerospace, medical and automotive. Polyetherimide (PEI) (ULTEM from SABIC) is currently the material of choice in aerospace applications. Stratasys Ltd is a leading 3D printer manufacturer using FDM technology. The company has collaborated with Airbus for developing 3D printing process and technologies for producing aircraft components using SABIC’s ULTEM polyetherimide (PEI) resins. Recently, in July 2017, Airbus has selected Stratasys Direct Manufacturing, a subsidiary of Stratasys Ltd., to produce 3D printed polymer parts for use on A350 XWB aircraft. Stratasys Direct Manufacturing will now mass produce non-structural parts, such as brackets and other parts used for system installation using Stratasys FDM production 3D Printers and ULTEM™ 9085 PEI resin from SABIC. Polyetherimide/Polycarbonate (PEI/PC) polymer blends have made their debut in the International Space Stations’ in-space manufacturing operations recently. Made In Space, Inc., has produced an object from blends of PEI/PC at their additive manufacturing facility (AMF) on the International Space Station (ISS). Founded in 2010, Made In Space, Inc. is the in-space manufacturing company engaged in developing state-of-the-art, gravity-independent production of parts for space station using 3D printing/additive manufacturing technology. Additive manufacturing in the commercial aerospace industry employs the blends of this aerospace-grade polymer ULTEM 9085 and ULTEM 1010 (PEI/PC). Use of PEI/PC blends for printing parts in space with AMF would enable the company to potentially deliver cost effective and efficient in-space manufacturing solutions. PEI/PC blends with nearly three-fold the tensile strength of ABS, a high strength-to-weight ratio, and low off-gassing properties has been employed in space on external hardware and satellites. While PEI is at the forefront among materials used in aerospace 3D printing sector, PEEK is gradually paving its way into this sector. In early 2017, European Space Agency (ESA) started officially testing 3D printed polyetheretherketone (PEEK) CubeSats and has future intentions of flying these 3D printed miniature satellites incorporated with internal electrical lines. For this project, ESA worked together with PIEP, a Portuguese polymer engineering firm and developed a printable PEEK that is electrically conductive with the addition of specific nano-fillers to the materials. By the end of the decade, the first PEEK printed structural part would fly on the Meteosat Third Generation series of weather satellites. Also to be noted is the point that GE Global Research has started exploring ways for 3D printing PEEK for aerospace and other applications with reduced production costs using Roboze One+400 3D printer. Addition of this new printer to the desktop line up would enable GE Global Research to evaluate innovative designs with extreme complexity enabled by 3D printing in areas already using high- performance polymers. Polyetherketone (PEEK) based implants, produced using traditional manufacturing technologies, have been widely used in the medical field. Now, PEEK is also penetrating into 3D printing of medical implants. Apium Additive Technologies GmbH, based in Germany, has collaborated with the Center for Dental and Craniofacial Sciences of Charité Berlin to determine the printing performance with PEEK compounds in dental applications. Apium is in the process of fabricating different structures using 3D printer initially to test their tensile strength in comparison to extruded samples, which will be followed by single crown frameworks being manufactured and compared in respect to their quality. Apart from this collaboration, Apium is also endeavouring to develop filaments for medical applications as implant material using Evonik’s high-performance polymer VESTAKEEP® PEEK. Apium will test how this material can be processed with FFF technology to be used as a material for 3D printed implants. Researchers at the International PEEK Meeting held in April 2017 planned to develop highly customized 3D printed medical and dental implants using polyetheretherketone (PEEK), and a PEEK-compatible FDM 3D printer. The additive manufacturing of medical-grade PEEK revolutionizes the ease, speed and accuracy required for implant production. In addition, the researchers highlighted the use of PEEK composites, such as carbon reinforced PEEK with high fatigue strength and a good elastic modulus for making these devices more robust and the potential of PEEK composite plates for fracture fixation. Leading global fluoropolymer company 3M Dyneon has now commenced using a 3D laboratory printer to expedite the company’s research aimed at the additive manufacturing of fluoropolymer components. Dyneon would employ a new patent-pending technology and use 3D printing for processing fully fluorinated polymers, such as polytetrafluoroethylene (PTFE). The stereolithography-based process has been developed by 3M Advanced Materials and allows the printing of fully fluorinated polymers, which is achieved by using a binding agent and the requisite additives, such as fillers that are employed in traditional production for the initial formation of a hydro-gel. Building on their experience in the 3D printing market gained through the supply of high-performance plastics, companies have now shifted focus towards supplying the end product itself, viz., high performance polymer filaments used in 3D printing. These high-performance filaments have become mainstay materials for FDM and FFF applications in the 3D printing industry. SABIC has recently introduced a new line of high performance filament grades for FDM 3D printing. The new filaments encompass ULTEM™AM9085F high performance PEI filament made from ULTEM™ 9085 resin, CYCOLAC™ AMMG94F general purpose ABS filament produced using CYCOLAC™ MG94 resin and LEXAN™ AM1110F general-purpose PC filament based on LEXAN™ HF1110 resin. Another leading polymer producer, DuPont Performance Materials (DPM) released three new high-performance filaments for 3D printing, which are based on Hytrel thermoplastic elastomer, Zytel PA high heat resistant polyamide and Surlyn ethylene copolymer, each of which provide individual functionalities. Instead of just offering high-performance plastics, manufacturers are aiming to make an important contribution to the growth and success of the additive manufacturing (3D printing) industry and penetrating further into the 3D printing value chain. Companies producing high-performance polymers are not only focusing on material developments, but also on partnerships and acquisitions to grab opportunities in the 3D printing industry. Among them, BASF is aggressively venturing in to 3D printing industry through partnerships and acquisitions. In mid-2017, the chemical conglomerate established a new business unit ‘BASF 3D Printing Solutions GmbH’ at the site of InnovationLab GmbH in Heidelberg, Germany to concentrate on pursuing business opportunities in the field of 3D printing. The new company will develop customized 3D printing materials, system solutions, components and services to meet the ever-changing demand of customers in industries such as automotive, aerospace and consumer goods. BASF 3D Printing Solutions also acquired Innofil3D, a filament producer based in Emmen, The Netherlands. This acquisition further reinforces the 3D business of BASF and enables the company to move ahead in 3D printing value chain, offering the filaments needed in the next processing level for 3D printing in addition to plastic granulate. BASF has also entered into an alliance with Hewlett Packard (HP) in the recent past for offering new 3D printing materials to customers through the HP Multi Jet Fusion Open Platform. Using this open platform approach, a customer can select a material supplier, such as BASF, for direct engagement in developing materials for specific 3D production applications. BASF is keen that ideas generated from this exchange are integrated for expediting the development a range of innovative materials for enhanced 3D printing products. Apart from BASF, Evonik is also participating in the open development platform for new 3D printing materials that was created by HP Inc. in the USA. Evonik expects that this participation will result in a further wave of development for additive production technologies. BASF has also partnered with Essentium to develop technologies to provide robust and strong 3D printing functional parts for use in mass production using fused filament fabrication (FFF) technology. To overcome the traditional interlayer weakness of 3D printed parts, BASF contributes with its range of polymer solutions to the partnership, whereas Essentium provides its FlashFuse™ electric welding technology, which enhances layer to layer adhesion of 3D printed parts. Through this partnership, BASF aims to create strong 3D functional parts and make this technology available for wide range of industrial customers. Industry Experts published a comprehensive global market report on High Performance Plastics titled ‘High Performance Plastics – A Global Market Overview’. This unique report reveals that Asia-Pacific is the largest volume consumer of High Performance Plastics, forecast to be 371.5 thousand metric tons (50.1% share) in 2016, which is also expected to record the fastest 2016-2022 CAGR of 6.8% and reach a projected 550 thousand metric tons by 2022. High performance plastics are used in applications demanding higher requirements than standard and engineering plastics because of their high strength, good chemical resistance, low coefficient of friction, performance at high temperatures, high quality electrical resistance. Major demand driver for the consumption of high performance plastics is the metal and other low performance materials replacement in demanding applications such as automotive, aerospace, electronics and medical, where high temperature resistance and strength is required. In the automotive & transportation industry including aerospace, growth is supported by metal replacement to reduce weight, while thinner and smaller components in electrical & electronics. This global report analyzes the high performance plastics comprising Fluoropolymers (PTFE, PVDF, FEP, PCTFE, PFA, PVF, ECTFE and ETFE), High Performance Polyamides (PA 11, PA12, PA 46, PA 9T, PPA and PARA), Sulfone Polymers (PESU, PSU and PPSU), Polyphenylene Sulphide (PPS), Liquid Crystal Polymers (LCP), Polyetherimide (PEI) and Polyetheretherketone (PEEK). The study also analyzes the key end-use sectors of high performance plastics including Automotive & Transportation, Building & Construction, Consumer Goods, Electrical & Electronics, Mechanical/Industrial and Others (such as Medical etc.). 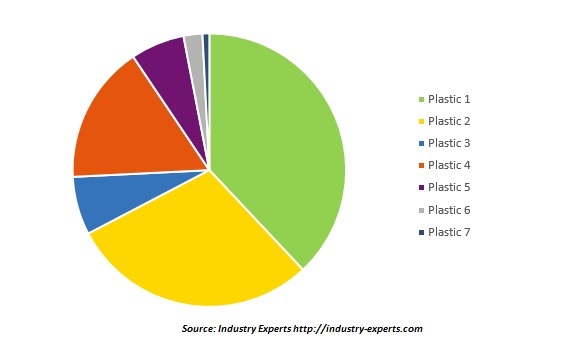 The global markets for the above-mentioned plastic types and end-use sectors are analyzed in terms of volume in metric tons and value in USD for 2012-2022 analysis period. The global market for High Performance Plastics is segmented into four major regions namely, the United States, Europe, Asia-Pacific and Rest of World. The regional markets further analyzed for 8 more independent countries across Europe – France, Germany, Italy and the United Kingdom; Asia-Pacific – China, India, Japan and South Korea. The market is analyzed in all of these major regions by key countries and by major end-use sectors in terms of both volume and value. This report also provides the comprehensive market analysis of each High Performance Plastics type by end-use sector. The global market for High Performance Plastics is likely to maintain a moderately faster, compared to volume consumption, CAGR of 6.1% during the same period and reach a projected US$15.9 billion by 2022 from a forecast US$11.15 billion in 2016. Fluoropolymers are the most widely consumed High Performance Plastics on a global basis, forecast to be 281.6 thousand metric tons (38% share) in 2016, which are anticipated to post the above average growth of 6.1% CAGR between 2016 and 2022 and reach a projected 402 thousand metric tons by 2022. High Performance Polyamides are the second largest high Performance Plastics with an estimated share of 29.3% (217.4 thousand MTs) in 2016 followed by Polyphenylene Sulphide (PPS) with a share of 16.4% (121.3 thousand MTs) in the same year. The report also examines the major global players for their production capacities by product type and location. This 560 page global high performance plastics market report includes 642 charts (includes a data table and graphical representation for each chart), supported with meaningful and easy to understand graphical presentation, of market numbers. This report profiles 33 key global players and 21 major players across Japan – 4; China – 16; and India – 1. The research also provides the listing of the companies engaged in manufacturing, compounding and processing of high performance plastics. The global list of companies covers the address, contact numbers and the website addresses of 414 companies.